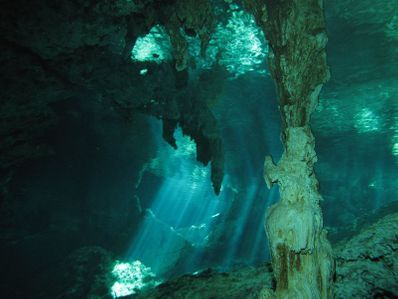 Cavern Diver Course with Dive Cenotes Mexico. Explore the underwater world of cenote caverns of the Riviera Maya, Mexico. The opportunity to explore our world of underwater caverns and caves is one available to only a few. The cave environment is a beautiful, exciting, and challenging environment which demands a great deal of those who choose to enter it. The Cavern Diver course offers the certified open water diver a first glance into the truly mesmerizing world of underwater caverns. The course is designed to insure you are properly trained and to give you the knowledge to permit you to dive within your limits of training and experience. As the first of three steps toward the Full Cave Diver certification, this course allows you to explore that portion of the cave system within the daylight zone. It provides you with the opportunity to experience the overhead environment in a controlled setting to determine if cave diving is of interest to you. The Cavern Diver course requires a minimum of 2 to 3 full days. ** Most of the open water dive gear can be adequately modified for this course since it serves as an introduction to the cave environment. In addition to standard open water gear, additional required equipment includes two lights and a safety reel (please review the cave equipment section for further discussion of dive gear with your instructor). The course can be performed with single cylinder with single outlet, however, we encourage the use of double cylinders at this level if you are planning on continuing to the cave environment. The curriculum consist of class sessions, gear review and modification, surface guideline drills and underwater skills such as line following and touch contact without visibility. Whether or not you decide to pursue additional cave training, the knowledge and experience gained in the Cavern Diver course will serve to greatly improve your open water dive skills and awareness. Please contact us if you would like to receive more information about the Cavern Diver Course or to make a reservation.